Approximately 200 people attended the press conference at Tk’emlups Moccasin Square Gardens today, March 4. 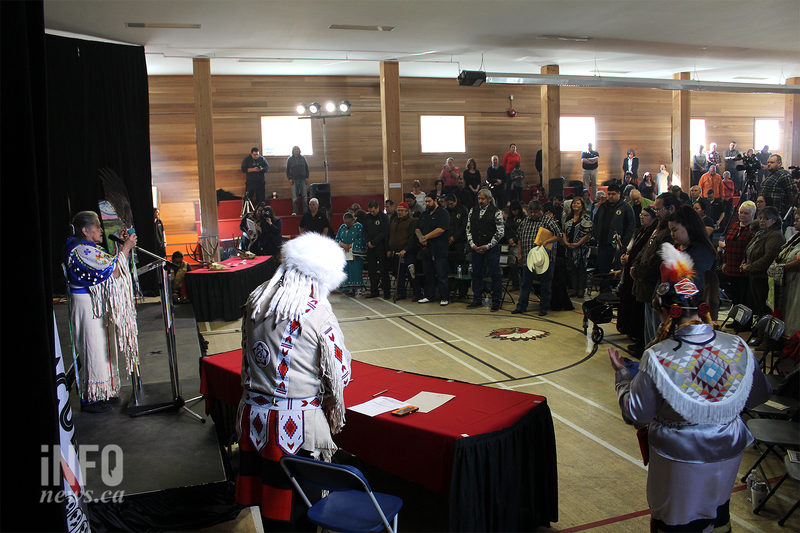 Drumming and singing accompanied the announcement of local First Nations’ official rejection of the proposed Ajax Mine. KAMLOOPS – The group representing local First Nations has officially rejected the proposed Ajax Mine. While the group’s decision doesn’t automatically nix the mine, it will impact the final decision by the federal and provincial environmental assessment offices. The announcement was delivered today, March 4 by Stk’emlupsemc te Secwepemc Nation, representing Tk’emlups and Skeetchestn First Nations. According to Tk’emlups Chief Fred Seymour, the panel reached total consensus against the mine and they have no intentions on changing their stance. The decision precedes the restarting of the assessment process, which was suspended last year in May. There’s no word on when it will restart, though KGHM, the mine’s proponent, is near completing its final submissions, according to a spokesperson. The City of Kamloops, which is in a similar position to the First Nations group in that it can support or object to the mine but doesn’t have final say, is waiting until the assessment process restarts to make a decision, with some councillors wanting to wait on the final pieces of information before deciding. The two First Nations also have an ongoing land title claim over part of the land the mine would be located on. Panel members named protection and preservation of the land and culture as top priorities in the decision. “Every day our language, culture and the values of who we are, are being lost. Our elders said to protect what little we have left and that’s what we’ve done, ” acting Skeetchestn Chief Terry Deneault says. Representatives of the First Nations group wouldn’t comment on the Kinder Morgan Trans Mountain Pipeline project, which is moving forward. The panel announced the decision at the Tk’emlups Moccasin Square Gardens.Chiefs from other First Nations in the region attended the announcement, along with local city councillors and provincial candidates from the Green and NDP parties. 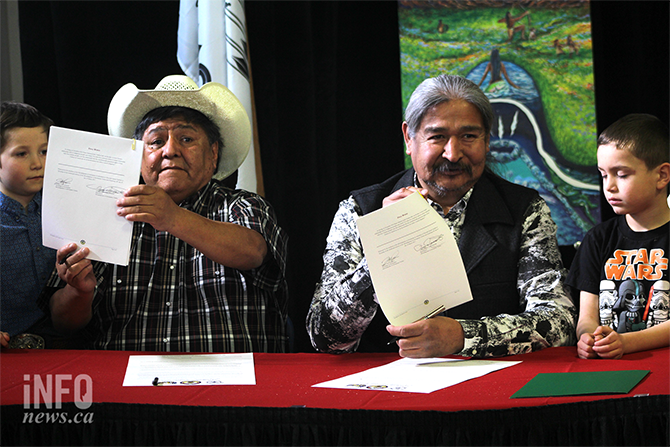 Acting Chief Terry Deneault (left) and Chief Fred Seymour (right) answered questions following today’s press conference announcing the local First Nations’ opposition to the proposed Ajax Mine. – This story was updated at 3 p.m. on March 4, 2017 to include more information from the press conference.